As a once fine daily newspaper serving Australia's capital city slowly and torturously disintegrates, an increasing number of smart young journalists are making the wise choice to jump ship. These are, in many cases, people with young families, mortgages, and mouths to feed (not to mention backs to clothe and roofs to provide). They are doing the wise thing by finding work elsewhere. One such is Californian-born night sub-editor Michael Pittman, who left The Canberra Times for more secure pastures on Sunday night. Michael is already being missed. He was a calm and conscientious colleague, a skilled sub-editor who got on with the job and was openly willing to learn a lot as he went. He and I got along well and I wanted to give him a parting gift, something to remember me by. 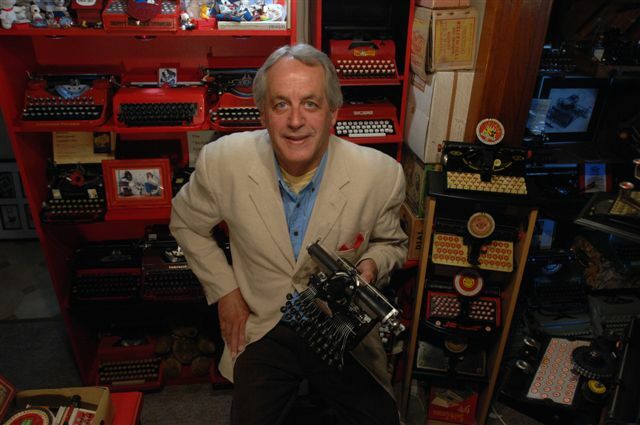 He was one of those people who gently tolerated - indeed fostered - my passion for typewriters. Michael used to act as my timekeeper when, deep in concentration, I needed an alert, as a eBay typewriter auction was about to end during working hours. This refurbished old Remington portable will hopefully do the trick. What a fantastic gift. I love that it has been personalized, and the two-tone paint is absolutely gorgeous. My phone now tells me when an eBay auction is about to go off, something I am very grateful for. I have only just recently purchased one of those new fangled 'intelligent phones', but this is really all the more it does for me than a regular phone...eBay, that is. I am sure he will love this machine. That is a fine gift on a melancholy occasion. The easy (all too easy?) way to bid at the last minute without having to be online is to use a service such as Auctionsniper. Robert, thank you firstly for the wonderful gift (I was right about my wife being very excited about it and planning immediately to photograph it) and secondly for the very kind sentiments above. Leaving the paper was a heart-wrenching choice. I began fantasising about giving up my day job and joining the night subs' desk full-time soon after starting at the paper as a casual, two years ago. It was a dynamic work environment, full of interesting people, who were doing work that I really enjoyed. I felt like I belonged there (something I know probably isn't going to be true of my new workplace). But, as you said, my primary job is being a husband and father, and I'd shovel pig crap with my bare hands if that was the best thing I could do for them. That said, I despair over what is going on at the paper and the industry as a whole. A lot of very skilled and experienced people are not being treated with the respect they are due and will probably be lost to industry soon. I wish you all the best, mate, and hope we can catch up soon.